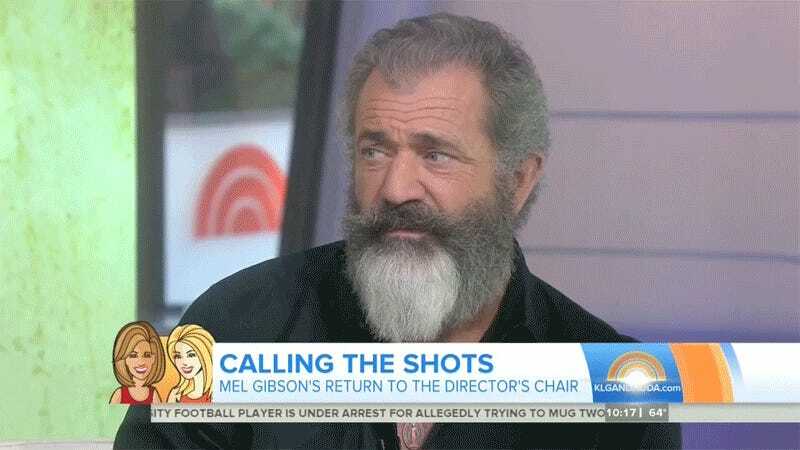 Thursday morning on Today, Kathie Lee Gifford gushed at Mel Gibson for about five minutes straight, at one point praising the noted purveyor of anti-semetic comments/director of Passion of the Christ’s new movie, Hacksaw Ridge, by saying it was exceptional because, “You rarely see authentic portrayals of people of faith.” Oh, okay. A clip reel of a “profoundly moved” Gifford’s gushing is above. Did you know that Braveheart (along with Funny Girl) is her favorite movie (until now I guess, since Ridge is supposedly Gibson’s best work ever)? Or that it’s a “miracle” that Ridge was shot in 59 days? Or that Gibson deserves all the great things happening for him? Please note her enthusiastic “What!” as Gibson tells a story about Ridge’s real-life protagonist Pfc. Desmond T. Doss at 1:07 in the video above. Gifford has never been more riveted in her life. Gibson’s reactions to her are enormously hilarious as well. You know you’re really something else when you freak out Mel Gibson.